Today’s story is by Pastor Jason Brown of Suntree Grace Brethren Church in Melbourne, Fla. He, along with two other families, was led to start a simple ministry: sharing a table with the community around them. Read on to hear how God is using this powerful act of obedience. I can make the claim that I love my brother or sister in Christ, but unless the evidence is found in how others view my actions, my faith makes no difference at all. I can make the claim I love God with all heart, soul, mind, and strength, and I can further make the claim I love my neighbor as myself. However, validation of said claim is the testimony of my neighbor — not simply the claim of my household. In the third year of my ministry as lead pastor at Suntree (January of 2016), I began praying through John 13:35 and Mark 12:30-31, which talk about loving God and our neighbor. One of the most profound things about these two passages is that they require third party verification. God answers prayer. He placed on the heart of a Bill and Jennifer Tweeddale, a household of the Suntree Grace Brethren Church, to purchase a picnic table and invite everyone on their street to break bread together one night a week. The result has been a series of gospel conversations, prayer requests, fellowship, and encouragement. 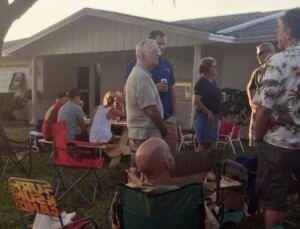 Since its initial start date, more than 30 people from their street gather each Wednesday, and others make a 15 to 20-minute drive to the Tweeddale’s neighborhood, where other neighbors have placed picnic tables either in their front yards or added to Bill and Jennifer’s. We’re praying to plant a church out of the harvest in this very location as a result of what Jesus is doing. The first week of August, we launched another family table ministry to reach unchurched and unsaved neighbors through another couple from our church: Chad and Milady Griffin started with prayer and one gatherer to reach out to their neighbors. They bought a picnic table, put invitations in mailboxes and, their first night, gathered everyone on their street. More than 50 people now attend. To date, Suntree has three locations reaching neighbors, praying with neighbors, and sharing intentional conversations about Christ with them. Our prayer is that we would see three to four Grace Brethren Churches planted in these locations as a result of what Jesus is doing through the heart of His people. Send a note of encouragement and find out how you can pray for this ministry by emailing Jason at gbcsuntree@gmail.com.